The Renault Duster AWD is barely a few months old in the Indian car market and the compact SUV is already operating in discount mode. Well, that may not be good news for the French car maker but it is definitely something you, the compact SUV buyer, can look forward to. The Duster AWD’s RxL 110 PS variant is now available at an ex-showroom price of 11.29 lakh rupees, which is 61,000 rupees lower than the pre-discounted price. The RxL 110 PS variant of the Duster AWD gets all the major mechanical changes that come with the top-end RxZ 11o PS AWD variant of the SUV, minus the bells and whistles such as cruise control, the MediaNav infotainment package and reverse parking sensors. The RxL 110 PS variant of the Duster AWD uses a 1.5 liter-4 cylinder K9K turbo diesel engine in 108 Bhp-248 Nm state of tune. A six speed manual gearbox, an all wheel drive system and an independent rear suspension are standard features. Renault has also packed in twin airbags, ABS+EBD, traction control, hill hold assist and electronic stability program as the standard safety features on the Duster AWD 110 PS RxL variant. So, if you want both safety and the go-anywhere ability of the AWD system rolled into a more affordable package, the Duster 110 PS RxL variant, with a chunky price drop to boot, is the way to go. The Duster AWD brings a host of strengths to the table. The AWD system provides heaps of grip through the twisties while also offering good traction in low grip conditions such as slush and sand. 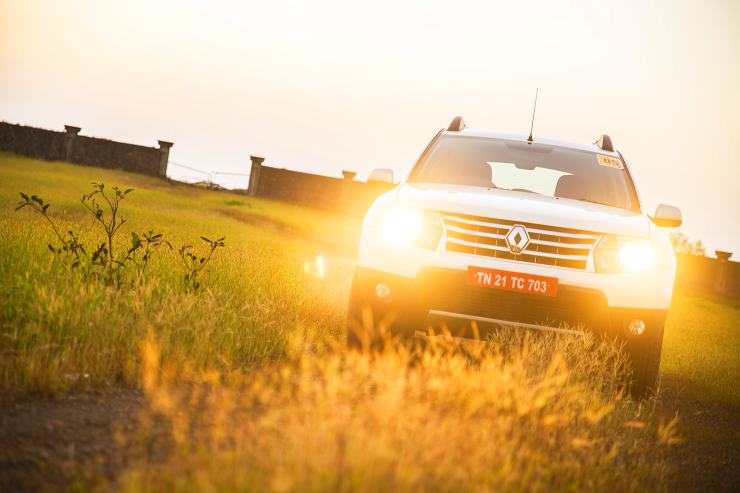 The independent rear suspension handles bad roads with aplomb, giving the Duster a very flat and pliant ride quality. The 1.5 liter K9K turbo diesel engine is now more responsive, what with the retuned ECU and the lower ratios for the first two gears making the Duster AWD a blast to drive across the rev band.